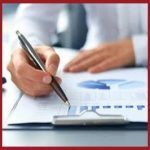 Week In Review - April 1 2019 | Investor Resources Inc.
U.S. Fourth-Quarter GDP Revised Lower to 2.2%… The final report on economic growth at the end of last year brings the total annual growth for 2018 to 3.0%. What it means – Consumer spending clocked in at 2.5%, and that’s about the best we can say for this report. Business investment was solid at 5.4%, but that’s lower than expected and isn’t very encouraging for a segment of the economy that got a huge tax break last year. Rounding out the disappointing news was retail investment, also known as housing, which contracted at the fastest pace of the year in the fourth quarter, down 4.7%. The only positive surprise was falling inflation. The GDP price index dipped to 1.7%, which is a clear indicator of why the Fed took its foot off the interest rate gas pedal. With the fourth-quarter numbers finally on the books, we can turn our attention to 2019. The Atlanta Fed’s GDPNow model jumped markedly in the past two weeks, and now stands at 1.5%. That a lot better than the 0.5% we were looking at mid-quarter. We’ve been skeptical of U.S. economic growth recently and remain unconvinced that GDP will post gains over 1%, but the Atlanta Fed’s model has been very accurate, so we must give it respect. If the economy expands by more than 1% in the first quarter, expect investors to breathe a sigh of relief and push equities higher. February Housing Starts Down 8.7%… Unfortunately, that number masks the big drop in single-family starts, down 17%. What it means – A double-digit drop in single-family starts is bad news, because it means that a lot of construction workers weren’t on the job. A lot of that could have to do with the extreme cold weather that blanketed much of the country last month, but the results are seasonally-adjusted, so some of that should already be considered. On the permit side, things weren’t as bad. Overall, permits dipped just 1.6%, and single-family permits were flat. 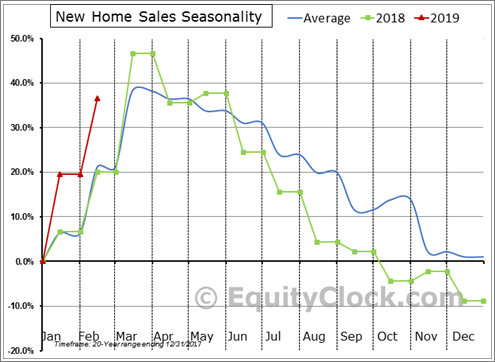 Just in, another set of revisions that will make your head spin, New Home Sales are suddenly higher for 2019, running above the seasonal average trend. But the strength comes at the expense of downwardly revised figures for 2018.The year-to-date change is now running 15.5% above average through the first two months of the year, a notable shift. January S&P/CoreLogic Case-Shiller 20-City Home Price Index Up 3.6% Year-Over-Year, Smallest Gain Since September 2012… The monthly index dropped 0.2%. What it means – Prices out west pulled down the average, with San Diego and San Francisco both posting monthly declines, and showing only 1.3% and 1.7% growth, respectively, for the year. The report echoes what we’ve seen in home sales reports for the past six months, so there are no surprises. An Anonymous U.S. Trade Official Noted Progress in Talks with China… The official claimed that China had made significant concessions on intellectual property and technology transfers. What it means – This is good news, since we’ve apparently reached an agreement on access to markets and other items. It’s interesting that the Chinese are making concessions. If true, it shows that Trump’s negotiating tactics are working. While his tariffs have caused some pain in the U.S., they’re clearly causing more pain in China. And lucky for the President, trade tariffs have all but fallen out of the news cycle in the U.S. When we strike a deal, expect a strong day or two in the equity markets. That might be a great day to take gains off the table. Special Counsel Robert Mueller Released His Report, Noting Trump Did Not Collude With Russians on 2016 Election…This wasn’t economic news, but it definitely dominated the headlines across all platforms for several days after a summary of the report was released last weekend. The president enjoyed a good couple of days before calling for creating more controversy by calling for the repeal of the Affordable Care Act. Border Patrol Estimates Up to One Million Illegal Immigrants Could Cross the Southern Border This Year… The number includes those who cross and look for work, but it’s mainly asylum seekers from Central America, and that’s the problem. When we last had one million illegal immigrants arrive in a year, they were almost exclusively young men looking for work. They evaded Border Patrol and did their best to move north. Now we’re seeing mostly families with children who immediately present themselves to authorities and claim asylum. We have nowhere to put them. Border patrol expects to see 95,000 in March, and perhaps 100,000 in April, and they simply aren’t equipped to deal with the influx. Lyft Pops Briefly In Its First Trading Day… The stock held near its initial $87 in early trading. It was a modest IPO for such a large company. The initial price created a valuation of $25 billion. We assume most retail investors who may love the company’s service, are unfamiliar with it’s financially bleeding like there is no tomorrow. Brokers’ preferred clients will be dumping this as soon as they find out how much red ink is being created. The IPO accomplishes two significant objectives. The creators and early private investors are wealthy with liquidity, and UBER will have difficulty IPOing unless it brings superior financial performance. “When the facts change, I change my mind. Relative strength measures the price performance of a stock against a market average, a selected universe of stocks or a single alternative holding. Relative strength improves if it rises faster in an uptrend, or falls less in a downtrend. It is easily applied to individual positions in your portfolio and to sectors and asset classes. A copy of our form ADV Part 2 is available online. WARNING: All e-mail sent to or from this address will be received or otherwise recorded by the Investor Resources, Inc. corporate e-mail system and is subject to archival, monitoring and/or review, by and/or disclosure to, someone other than the recipient. This message is intended only for the use of the person(s) (“intended recipient”) to whom it is addressed. It may contain information that is privileged and confidential. If you are not the intended recipient, please contact the sender as soon as possible and delete the message without reading it or making a copy. Any dissemination, distribution, copying, or other use of this message or any of its content by any person other than the intended recipient is strictly prohibited. Investor Resources, Inc. has taken precautions to screen this message for viruses, but we cannot guarantee that it is virus free nor are we responsible for any damage that may be caused by this message. Investor Resources, Inc. only transacts business in states where it is properly registered or notice filed, or excluded or exempted from registration requirements. Follow-up and individualized responses that involve either the effecting or attempting to effect transactions in securities, or the rendering of personalized investment advice for compensation, as the case may be, will not be made absent compliance with state investment adviser and investment adviser representative registration requirements, or an applicable exemption or exclusion. Copyright © Investor Resources Inc. All rights reserved. Investor Resources, Inc. is a registered investment adviser in the States of Washington, Arizona and Texas. The adviser may not transact business in states where it is not appropriately registered, excluded or exempted from registration. Individualized responses to persons that involve either the effecting of transaction in securities, or the rendering of personalized investment advice for compensation, will not be made without registration or exemption.